Merry Christmas, my vapors! Today I will introduce you two vape tanks, which has its specific features. 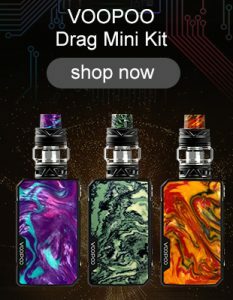 Manta RTA from the manufacturer Advken, which was released more than a year ago, quite quickly after its release, became simply very popular among users. The device received high marks because of its quality, constructiveness and taste, especially since at that time there were not so many similar Chinese tanks on the market, and the leaders were Petri RTA and Reload RTA from their American colleagues, which were worth a lot of money. By disassembling the above part of the tank, we can replace the straight glass with a “bubble version”. In this case, the Manta MTL RTA vape takes on a slightly “pot-bellied” appearance, but is still acceptable. The volume of the flask increases to 3 ml, which cannot be called some kind of supernatural indicator, but already more digestible. Vandy Vape Phobia V2 RDA drip is sold for a gloomy design cardboard box, on the front side through the slot in the form of a toothy skull without the lower jaw the device itself is seen, the name of the manufacturer is indicated above, and the name of the atomizer and the Alex logo are shown below. On the reverse side, in addition to the logo and the image of the air passage inside, there is a warning about the use, a number of badges and certificates, the inscription “Made in China” and a detailed inventory of the delivery set. It was these coils that were put in the kit, and they also added a fit for trimming the legs, the recommended length for the PHOBIA 2 RDA vape is marked with a sticker. The ladder turned out to be comfortable, perhaps somewhat gloomy and instantly lost on a dark table because of its black color. It is worth mentioned that Manta MTL RTA is not so bad if we consider it in the context of free puff. And Vandy Vape Phobia V2 RDA despite a number of design features turned out tasty and easy to use. THC Tauren RTA & Ammit MTL RTA – Innovations for airflow!